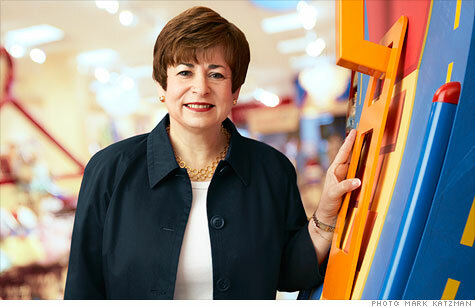 Build-A-Bear's Maxine Clark: "The retail world had lost its spark." One of my favorite things as a child was to go shopping with my mom, and looking was as good as buying. I always had a curiosity about how people shopped. In 1971, when I graduated from college, I wanted to do anything women weren't doing at the time. So I went to work for Hecht in Washington, D.C., as a retail executive trainee and kept getting promoted up the ladder of May Co., which was later bought by Federated Department Stores (now known as Macy's (M, Fortune 500)). In 1976, I was promoted to the May corporate offices in St. Louis and worked for the CEO on business development, special projects, and acquisitions. In the 1980s, I moved to the discount side of the company, and in 1992, I became president of Payless ShoeSource. When I got to the top, my financial rewards were very high, but my psychic income bank account was nearly empty. I felt the retail world had lost its spark. I wanted to be more creative again, so in 1996, I left the company. One day, I was shopping with Katie Burkhardt, the daughter of one of my good friends, and her brother Jack, who collected Ty Beanie Babies. When we couldn't find anything new, Katie picked up a Beanie Baby and said we could make one. She meant we could go home and make the small bears, but I heard something different. Her words gave me the idea to create a company that would allow people to create their own customized stuffed animals. I did some research and began putting together a plan. I'd been a buyer all over the world, so I knew how things were made. I began talking to friends and their kids about this idea. Build-a-Bear Workshop would be like a theme park factory in a mall. Every parent said, Why would you want to make your own stuffed animal when you can buy it at Target (TGT, Fortune 500)? But the kids of my friends were so excited about doing it. There were no formal focus groups, but from the beginning, Build-a-Bear Workshop has had a Cub Advisory Board, which is a group of children who offer their opinions about our products and services. Kids have insights and offer inspiration by looking at the world differently. In 1997, I withdrew $750,000 from my retirement account to get Build-a-Bear Workshop off the ground. That covered startup costs and the building of the first prototype store. I also secured a bank line of credit for inventory and working capital, with my house as collateral. I knew I wanted to build a multimillion-dollar business with hundreds of units, and I realized I didn't have the ready cash to fund that growth. I knew I'd have to partner with outside investors. While we were building our first store, coming soon signs prompted a St. Louis Business Journal story about our unique hands-on concept. The article caught the eye of Barney Ebsworth, who owned a private investment firm, and his partner, Wayne Smith. They bought in for 20% for $4.5 million, so with that, I had enough to go for several years, and we hadn't even opened yet. The first store opened in the St. Louis Galleria on a Sunday, and there were lines out the door. In the beginning, landlords didn't know the concept, so persuading people to rent us space was hard. In year two, we had malls begging us to come in. Other investors came in 1998 and 1999. We had to turn investors away after that because the business was so successful, we didn't need their money. We started with just bears and clothes. We added shoes and accessories, then more animals. We licensed products and started carrying costumes from Disney (DIS, Fortune 500) and Major League Baseball teams. We hit a good nerve. At a time when everything was going high tech, high touch and hands-on was a good balance. We started when the Internet was just getting popular, so we were able to track people in our loyalty program from day one, and continually do customer research. We're constantly creating new product, so there's no niche that needs to be filled. Everything is focused on the customers and giving them a good experience. We want to engage kids beyond selling them something in our store. Every year we look for 10 children around the country who are doing things to help their communities, and we name them our Huggable Heroes. We focus on good price, convenience, and location, and we hope that when you leave, you have a smile on your face. Successful retailers -- whether it's Macy's or Apple (AAPL, Fortune 500) -- do these things. We began in big cities, and when we got up to store 150, we started opening in smaller markets with good-size family communities and tourist destinations. In 2004 we opened our first overseas store in Japan, and are now in 19 countries. Almost 40% of our store base is outside of the United States, and we are putting the support and infrastructure in place to continue this expansion. We also see e-commerce as a growth opportunity -- on our website and through mobile technology. The recession affected the business substantially. We slowed our growth, cut costs, and mall traffic was down. We strategically closed some stores, opened stores in new locations, and updated existing locations. Now, mall traffic is coming back. Take your employees seriously. Every six weeks we do Chief Chat at headquarters. Employees can ask any questions they want. We get good feedback and understand what matters to our associates. We also do remote conferences with people in the stores by Skype, and I go to the stores all the time. Write the biggest business plan you can. You can always cut it back. The first purpose of the business plan is to convince yourself that it's an idea you really want to do. If you're not convinced, you'll never be able to convince anyone else. Understand the value of partnerships. In the beginning, our vendors were willing to make a couple hundred pieces of everything. Normally they wouldn't do such a small amount. But then they benefited from our success. Always ask, What can we do together to get more than our money's worth? This interview is from the March 19, 2012 issue of Fortune. What's Gilt Groupe's secret weapon?